Aerosmith could not have put out a better album to follow up on the highly successful and popular “Toys in the Attic” album. “Rocks” does exactly what it says on the label, it rocks! Many albums have what I call great opening tracks and this is definitely with the opener here. “Back in the Saddle” can be listed as one of those first tracks that say “You’re gonna listen to this album and like it.” Of course, the other tracks on the album like “Last Child” and “Nobody’s Fault” along with all of the others back up the first track and make “Rocks” a truly memorable album. 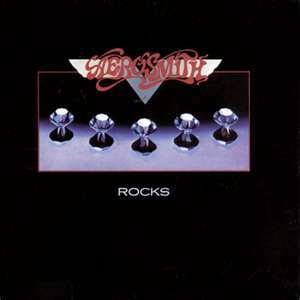 Many great metal acts from the 80s and since have sited Aerosmith’s “Rocks” album was one of their greatest influences. Acts from Metallica to Kurt Cobain to Slash and more all pay homage to this great offering in music. Furthermore, many tracks, especially “Nobody’s Fault” has been covered by many times. As great classic rock albums go, this is one of the best. This entry was posted on October 30, 2011 at 2:35 pm and is filed under Heavy Metal, Heavy Metal and the 1980s, Music with tags Aerosmtih, Classic Rock, hard rock, Heavy Metal, Heavy Rock, Michael D. LeFevre, Rock And Roll Children, The 1970s, The 1980s. You can follow any responses to this entry through the RSS 2.0 feed. You can leave a response, or trackback from your own site. I dig this Aerosmith album a great deal! “Back In The Saddle” never fails to psyche me out… a true classic song from as you put it “one of the best” (albums). Thanks Metalodyssey, Back in the Saddle is one of those song that I find uplifting whenever I hear it. I will be finally progressing to the next stage where I visit the great albums of 1978. In the meantime, I have a couple of albums left to visit, that is unless I remember so more. Excellent weblog right here! Additionally your web site quite a bit up very fast! What host are you the use of? Can I am getting your affiliate link to your host? I wish my website loaded up as quickly as yours lol. Sorry For poor English. Goodbye from Brazil! Thank you, it’s great to see I’m reaching people in Brazil. Please tell more people about this site and my book Rock And Roll Children.